I've done large vs. small lube groove shootouts in the past, and usually didn't see a significant difference. But a recent problem with the 7BR in cold temperatures made me wonder if bullet design could play a role in cold temperature performance. So let's see. 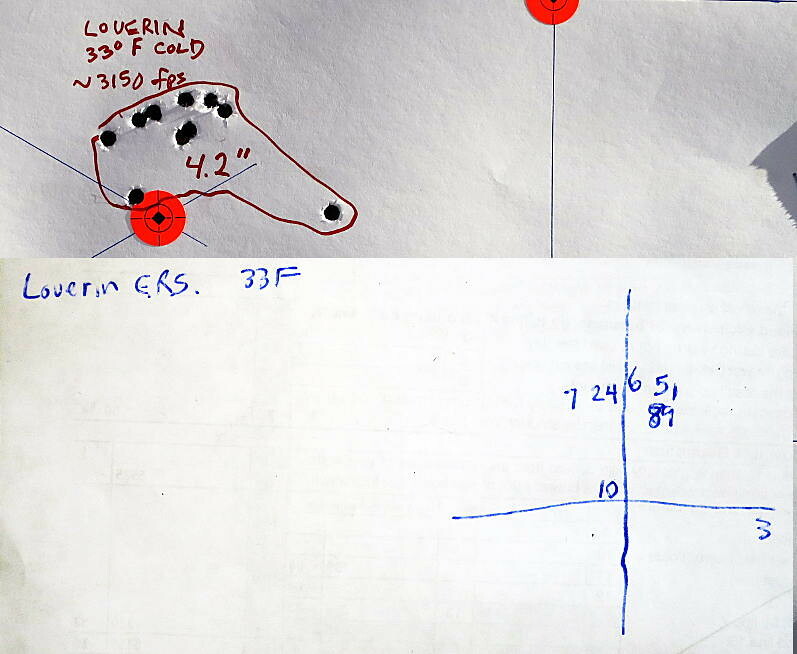 A "Loverider" design on the left vs. an "XC" design on the right, both based on the same basic 7mm 100 gr. GC design that I've been shooting for quite a while. I use the "XC" label loosely because it has minimal lube grooves similar to the 30 caliber NOE XC design, however it does not pretend to be an exact copy of the XC. 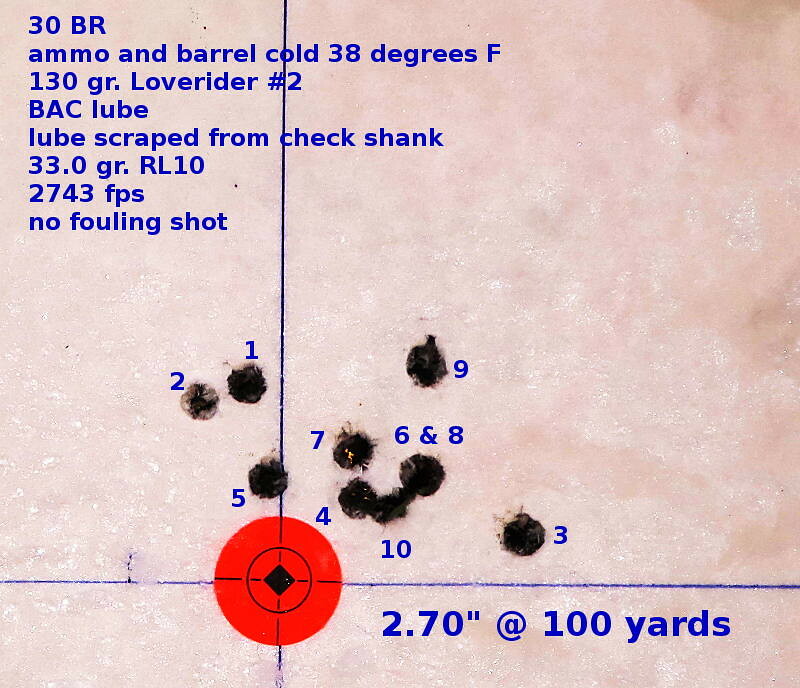 Here's a 10 shot group with a cold rifle and cold ammo. The rifle and ammo were 33 degrees F. Starting with a cold clean barrel, one fouling shot was fired, then the 10 shots for group, pausing one minute between shot so the barrel never even got warm to the touch. Then I cleaned the barrel with Ed's Red and allowed the rifle to cool for an hour before repeating the same procedure with the XC bullet. 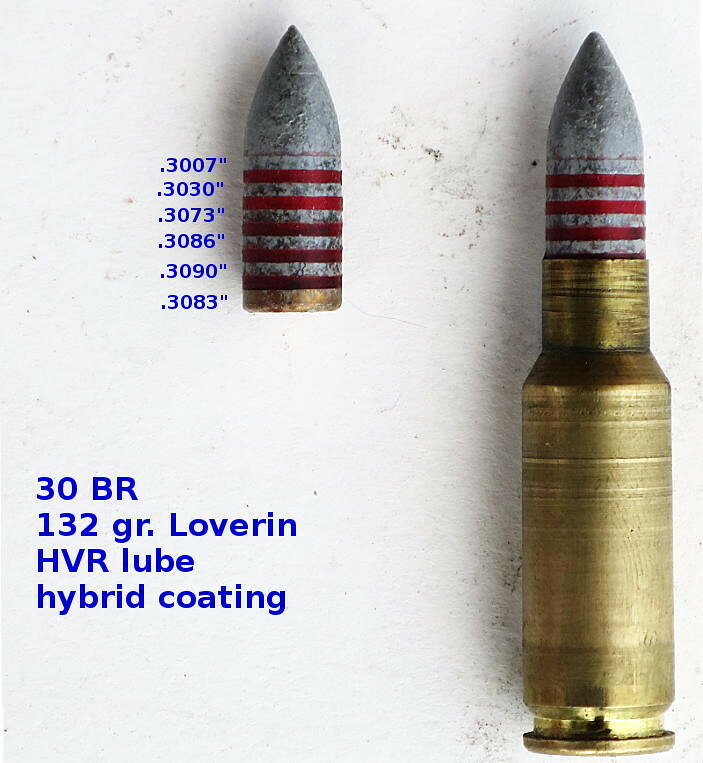 A previous target with the standard "Loverin" bullet is pasted into the photo for comparison. Due to concerns about gas checks coming off in flight and smacking the chrono, I did not chrono these loads, but it normally runs 3150 fps with the usual load of 32.4 gr. LT30. You can't prove much with a single group, so all I was looking for today was whether the bullet would shoot a group or whether it would spray bullets all over the target. Also whether any gas checks came off (neither experimental bullet shed any gas checks today). So far it does appear that bullet design may influence cold weather performance, but I'd like to repeat the cold weather shootout before jumping to conclusions (you can't shoot multiple cold groups in one range session because the barrel warms up after several shots are fired). There are a lot of variables at play here so it may take a lot of testing and a lot of time to figure out what is going on. Some of you may remember that the original Barnes X bullet was "smooth," without grooves. I bought some shortly after they first came out, and they weren't very accurate in my rifle. 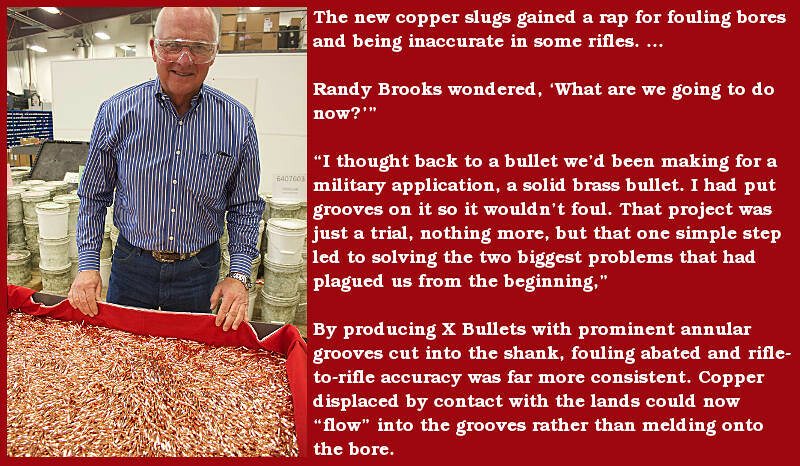 So the theory is that grooves give the metal displaced by the rifling somewhere to go. If the displaced metal doesn't have anywhere to go, then the entire bullet gets squeezed like a tube of toothpaste, and there is a risk that the distortion may be uneven. 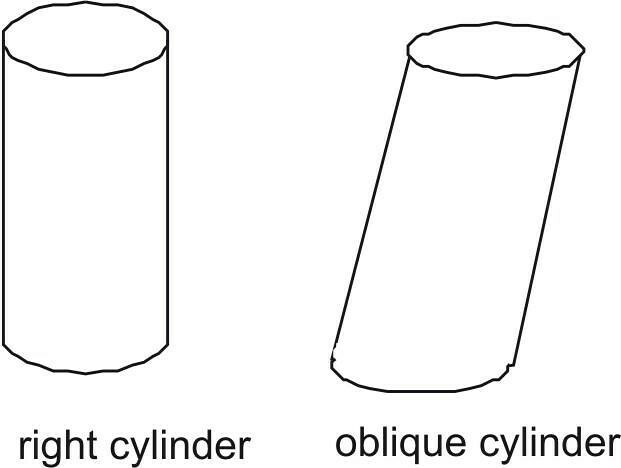 The base of the bullet may become oblique. We don't know for sure what goes on inside the barrel. But we do know that bullet distortion might hurt accuracy and can't help, so we'd like to minimize distortion. 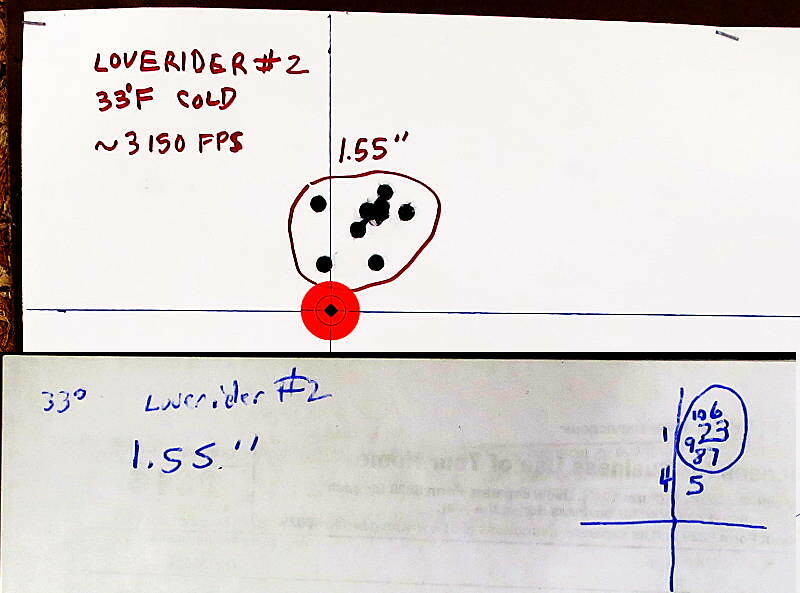 My "Loverider" designs are an attempt to minimize distortion when the bullet is engraved by the rifling. OK, as promised I am repeating the cold temperature shootout. I also added one new bullet design to the lineup. 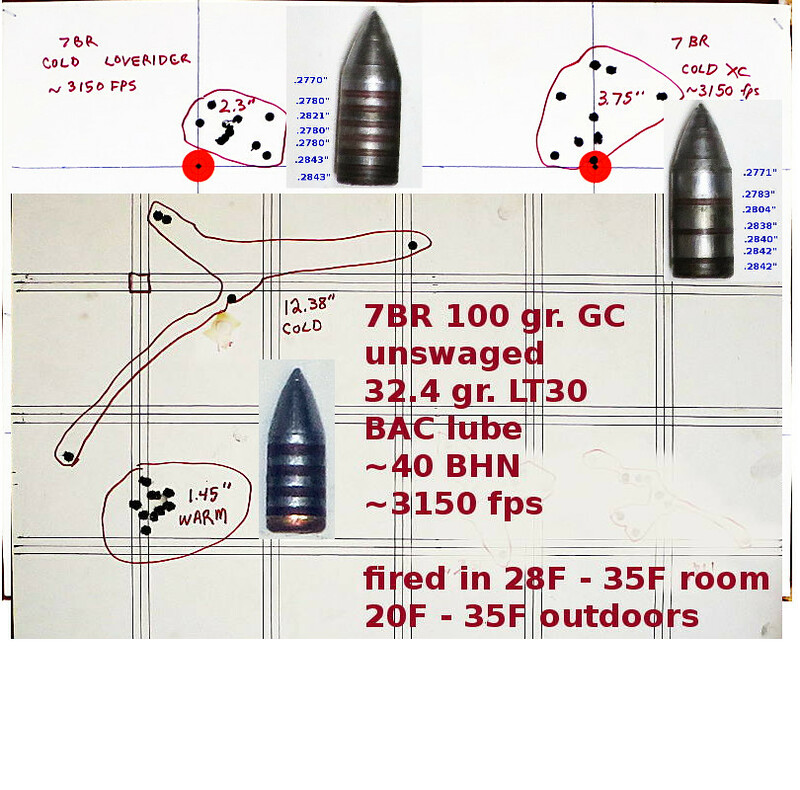 Here's the 4 bullets in the test. Note that there are differences in the check shanks. 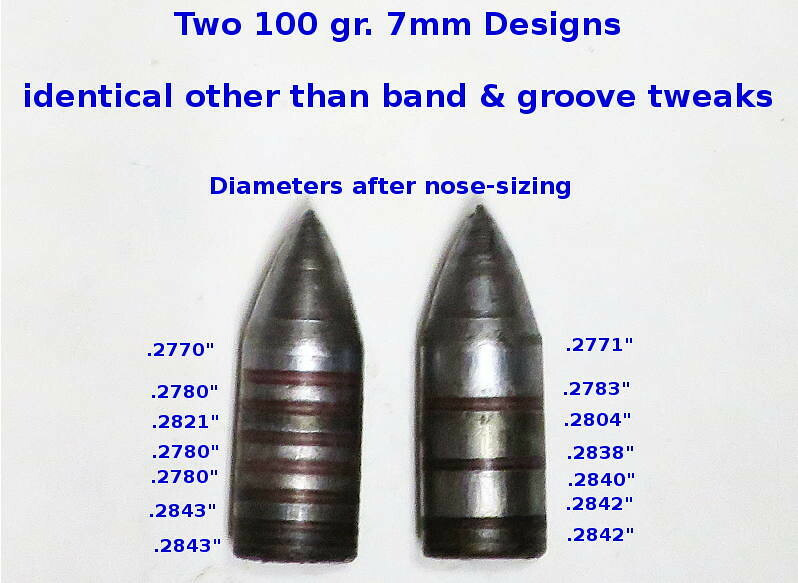 All the bullets received the same sizing routine so they fit the throat the same. Same load and same procedure as before -- store the rifle & ammo in the unheated shooting shack, shoot one fouling shot, then shoot one group, pausing at least one minute between shots. Then swab barrel with Ed's Red and let it cool off for at least an hour. Rinse, lather, and repeat. 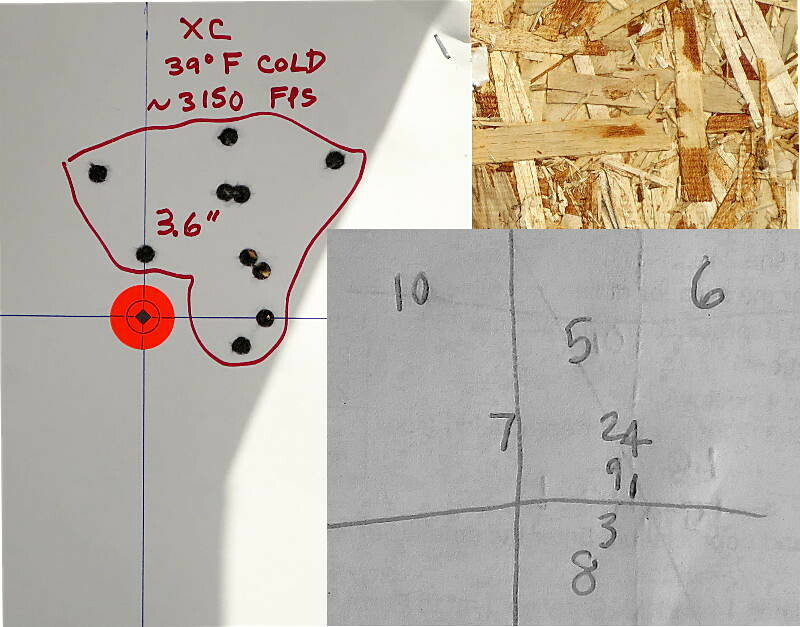 All we are looking for with these cold temperature tests is whether a bullet design will shoot a group vs. whether it sprays bullets all over the target. Here is the target for Loverider #2. 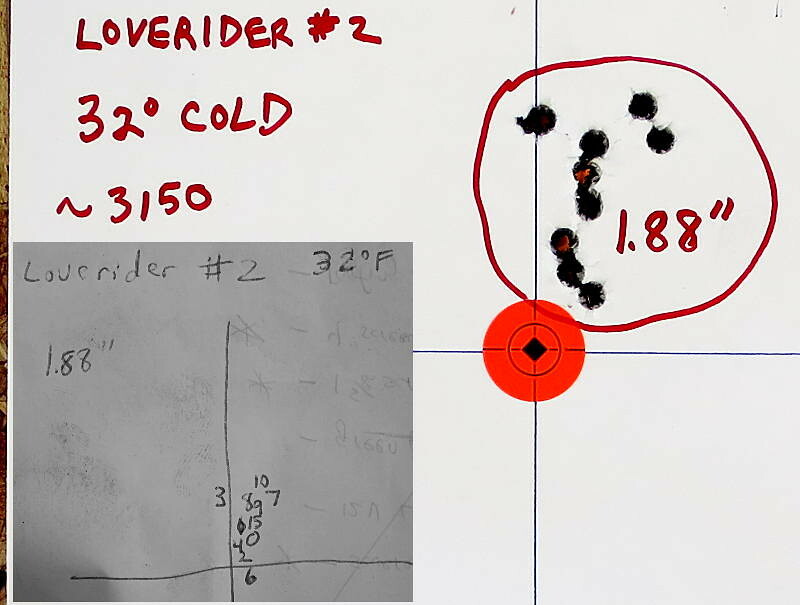 The scribbling below the target designates which shot went where. #1, 4, and 5 were the outliers. No gas checks came off. I'll add the other targets as the day goes by. Here's the loverin bullet. #3 and #10 were the outliers. No gas checks came off the loverin today. Here's the XC. The temperature had warmed up to 39 - 40 degrees F. No gas checks came off. Surprisingly, the outliers were #6, 8, and 10. Loverider #1. The outliers were #5 (might have been #1), #4, and #9. No gas checks came off. Loverider #2, again. The outliers were #6, #3, #10, and #7. This time I happened to record the point of impact for the fouling shot (#0), too, and included it in my sketch. The fouling shot would have gone into the center of the group, a very desirable characteristic. No gas checks came off. So the results were mostly consistent except for the Loverin bullet which alternated between shotgun pattern and merely lousy. 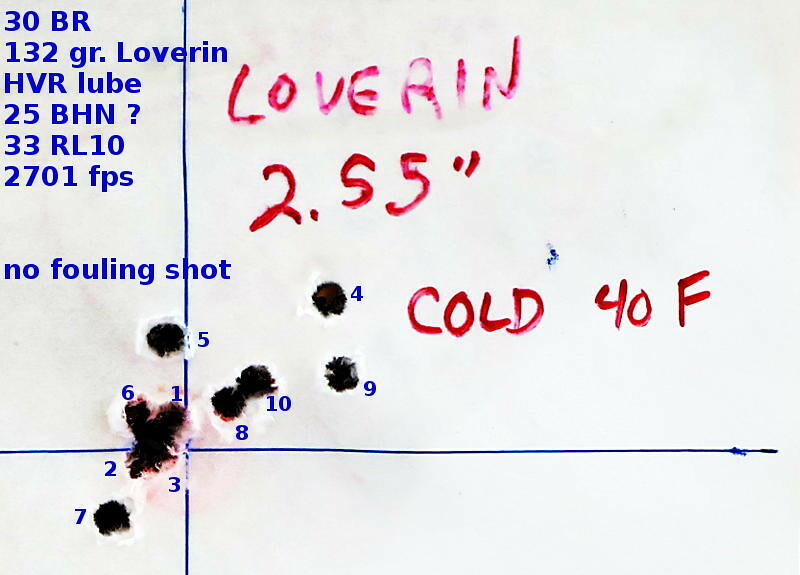 None of the cold temperature groups were as good as the Loverin's warm temperature average of 1.4" - 1.5". 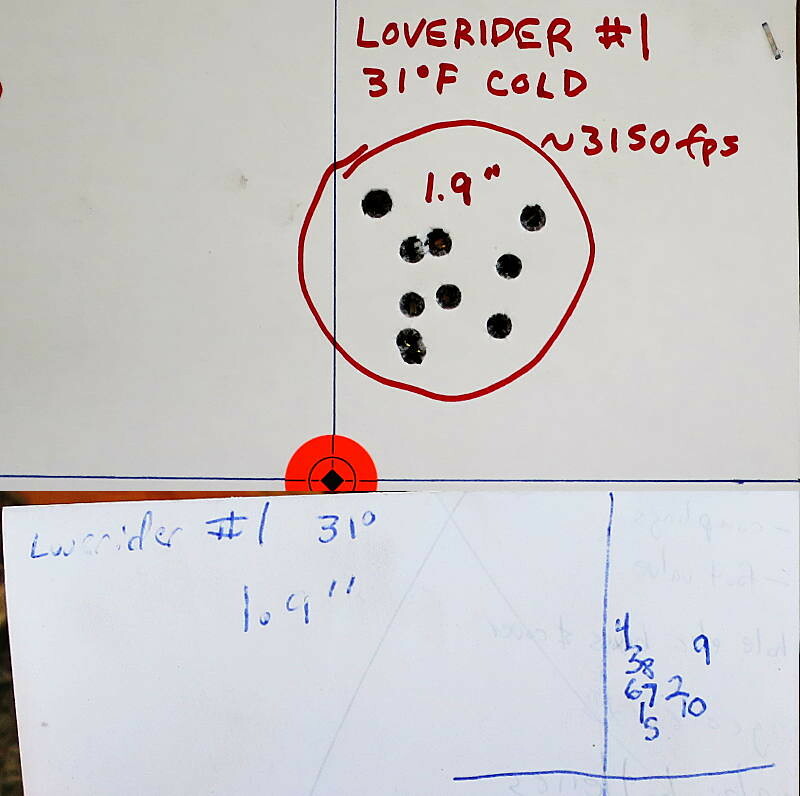 These tests have proven that bullet design definitely affects cold temperature performance, with the Loverider being the least temperature sensitive. The type of lube probably affects cold temperature performance, too, but that's another test for another day. The check shank length may be a factor, with the shorter shanks being less temperature sensitive in this shootout. At the very least, we can say that the short shank on Loverider #2 might have helped, and certainly did not hurt. The theory behind that is that, if the lube is too stiff and if the clearances are too tight for lube to squirt out of the way as the lube on the check shank is engraved by the rifling, then hydraulic pressure might be pushing the check off the shank. I have no way to prove or disprove that theory, but it does sound reasonable. 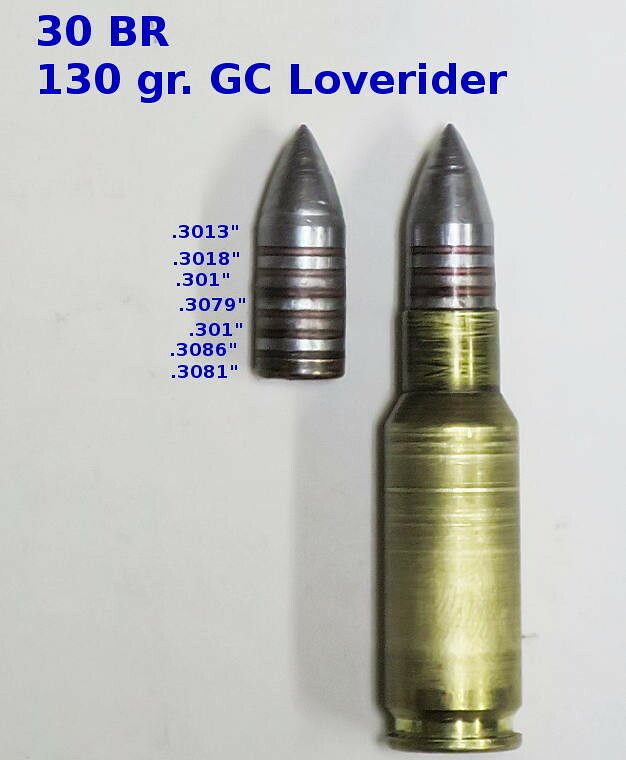 -- test Loverider #2 with enhanced reclaimed shot, because I'm wondering if a harder alloy would help compensate for the minimal groove diameter bearing area of the Loverider design? Rifle and ammo were 40 degrees F. A randomly picked load of 32.0 gr. RL10, oven treated reclaimed shot about 35 BHN, and BAC lube. Velocity ranged from 2608 (the 1st shot) to 2677 (the 9th shot). I broke from my usual practice of shooting a fouling shot, and instead fired the very first shot into the group. It landed in the center of the group. The outliers were #4 (the highest shot) and #5 (the low flier). This was a new-to-me bullet in a new-to-me chamber and a new-to-me load, so I have nothing to compare it to. For now I can only say that it shot a group rather than a pattern, and the first shot from a cold clean barrel went into the group. It did shed 3 gas checks out of 11 shots, though. I'm getting the impression that gas checks are more likely to come off in cold weather than in warm weather? 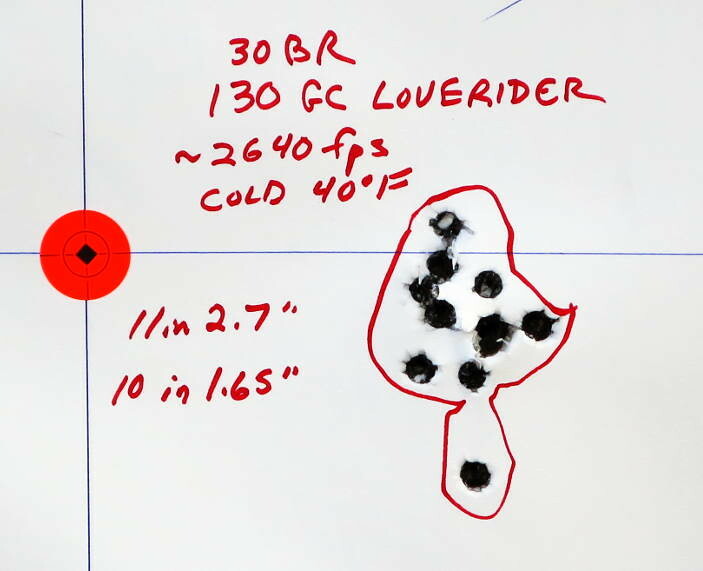 A retest of the 30BR Loverider, except with the lube scraped out of the check shank, and more velocity. Now let's shoot a Loverin for comparison. This one happened to fit the throat a little better than the Loverider. The cold Loverin shot just as well as the cold Loverider in this particular barrel. So far it appears that the Pacnor 7BR is very fussy in cold temperatures, and prefers a Loverider design. However the Krieger 30 BR is not so fussy, and has no preference in bullet design. Neither barrel gives top accuracy when cold with any bullet.